So as you can probably tell, I’m not very creative when it comes to making a title for a blog, but nonetheless, I bring you my very first blog. Here in Copenhagen, it is not unusual to see a bike on the road, even in the rain or frigid cold. Here bikers have their very own lanes, with left/right turning lanes and stop lights as well. It is also common to see bikers talking on their cell phones while biking, which is especially surprising since Canada has just banned driving with handheld devices. So I would like to take a look at some Danish statistics and facts. According to Copenhagen’s Bicycle Account of 2008 (http://www.sfbike.org/download/copenhagen/bicycle_account_2008.pdf), the number of cyclists who were seriously injured in 2008 stood at 121 individuals, though the causes were not specified. To put this into perspective, 1 casualty occurs for every 3.2 million cycled kilometres.Copenhagen hopes to reduce the casualty rates to a maximum of 59 individuals by 2015. Bikers can take their bike onto the train with them, furthermore reducing the need of personal cars. 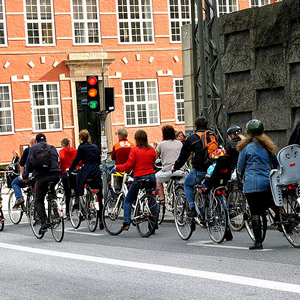 37% of all those studying or working in Copenhagen cycle. Copenhagen also has green cycle routes, which are routes that avoid large traffic areas and travel through parks and waterfront areas. These can be used for cycling, walking, and other recreational activities. Currently, there are 40km of green routes which have been established, and in the coming years more routes will be made, totalling 110km of green routes (www.kk.dk). Denmark, especially the city of Copenhagen, has taken many great initiatives, such as green routes, bike lanes, storage areas and so on to ease the transition from car to bike. Countries all over the world should be looking to Denmark, and of course Holland, to see the success and advantages of what cycling can bring to not only a better environment from reduced emissions, but also better health and satisfaction. ← Is China doing enough?